Then, presenter Dan will even be giving your pets a shout out on air in Animal Hour, every weekday from 2pm! Click here to check out the gallery! Enter your details to put your pet into gallery. Anita’s pet rabbit, Barley, who is 10 years old and loves broccoli! This is 11-year-old Kirsty’s dog, Belle, who is very cute and cheeky! This is Caellaigh’s english bulldog. 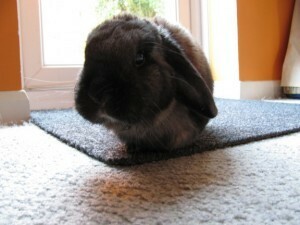 Abbie, aged 7, has sent in this pic of her rabbit, Henry. 10-year-old Megan’s pet guinea pig, Buster. Solene’s two cats, Leo and Tiger-Lily, enjoying their bunkbeds! This is Bumble, a birthday present for Caitlin, Bethany and Sophie. This is 7-year-old James’ dog, Chocolate. This is Imi and Kathy’s very cool dog, Alice. She was once in American Vogue! This is Charlie’s pet cat, Daisy, who loves ping pong balls and taking socks from the washing basket! Here are Lynn’s pet ducks. Here is 10-year-old Lily’s pet fish, called Finny. She loves to show off and is funny to watch. This is 10-year-old Georgia’s pet dog, Cheeky, who really likes to play with her toys! This is 10-year-old Lorna’s kitten, Gizmo. He loves having play fights with his brother, Percy. This is Gregory’s pet cat, Garth, apparently the best cat in the world! This is Hannah’s cat, Sherlock. He loves melon, tuna and drinks from his own special glass on the table. Jess, aged 10, with her border collie. She says he’s a bit of a poser! This is 13-year-old Leah’s pet cat, Jingles. She found him 5 years ago with no owner so they took him in. He’s very funny and cuddly! Jojo from Lizzy, aged 12. He can do lots of tricks and is great to cuddle! This is 13-year-old Keira’s pet goat! There’s Toffee who is brown and Dotty who is white. This is 10-year-old Megan’s pet guinea pig, Mack. He’s funny and noisy! This is Laura’s dog called Maisy. She likes sleeping and rolling around in the mud! This is 10-year-old Aimee’s pet dog, Matty. She is one of the dogs they foster before they find a permanent home. This is 7-year-old Max’s pet dog, Sally. They love wrestling together! This is Clive and Jeff. They are goldfish who live in Miss McSweeney’s class. This is 10-year-old Megan’s pet cat, Daisy, sitting in a laundry bag! This is Alexia’s pet kitten, Minty, only a few weeks old! This is David’s pet cat, Mischief. She loves exploring and finding new toys to play with. This is Rachel’s pet dog enjoying the snow! This is Richard’s border collie, Sasha. She was unwanted because she’s deaf, but Richard kindly took her in! She is probably the naughtiest dog in the world! This is 10-year-old Josh’s pet dog, Roxy, playing in the snow. She’s a Cavalier King Charles and loves playing! This is 8-year-old’s pet cat, Scratchy. She loves eating the duvet! This is 9-year-old Shane’s pet dog. This is 10-year-old Honor’s pet rabbit, Skittles. He says Skittles is fat but amazing! This is 10-year-old Aimee’s pet cat, Stevie, who is very best friend! This is Alishia’s cute puppy, Stormy, when he was just 15 weeks old. This is 7-year-old Charle’s pet dog Percival. He’s a wire fox terrier which is the same dog TinTin has! This is Luke’s kitten called Tiger. This is 7 year old Zaniab’s pet Catty! This is Daniel and Olivia with their pet cats Tyrion and Arya! This is Alex with Charlie, Nigel, Willow, Bella & Rosie! Say Hi to Hiro! This is Luna’s pet Alaskan Malamute!